Is your globetrotting life full of little incidents, insights, views, colors, smells and other bits and pieces that don’t stand alone as a big adventure or an amusing story, but are fun or interesting just the same? I have lots and for this post I’ve stitched together a few random ones fished out of my treasure box of odds and ends. 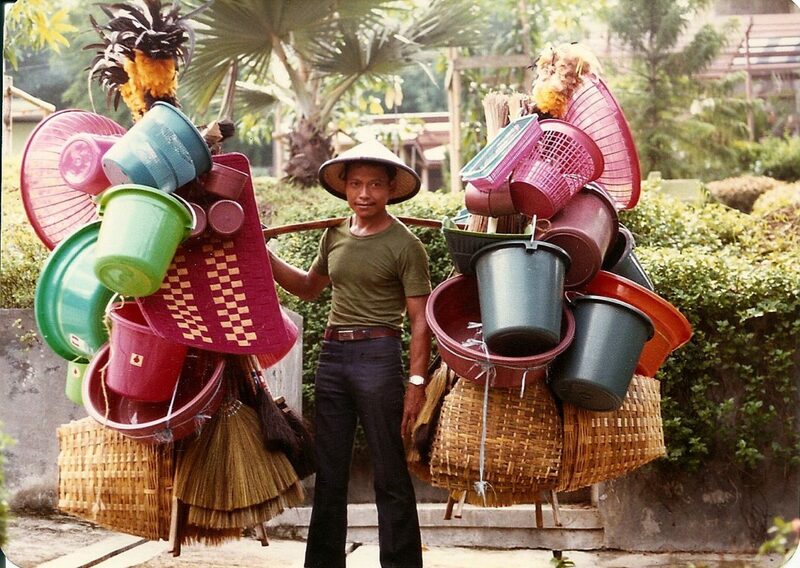 This photo is of the vendor who, in INDONESIA, used to walk by our house with his enormous load of plastic ware and assorted housecleaning paraphernalia. Sort of like Walmart on legs. He was a nice, smiling man, but when I asked if I could take a picture, he turned instantly serious. The same story with the flower vendor who would come to the door every week with huge baskets full of gorgeous tropical flowers. It’s a common reaction of people in many countries. The cheeriest person looks instantly funereal when faced with a camera. All over ARMENIA you find statues and monuments hailing from Soviet times. I like this one especially because an Armenian friend told me it’s affectionately called “Throwing Mother-in-Law Out of the House.” It was probably erected to the glory of working men and women. Or something like that. I was quite taken with this building in downtown Tirana, the capital of ALBANIA Every time I looked at it from the balcony of my tenth-floor apartment across from it, I had the impulse to lick it. I can’t decide if it looks like a frosted cake or a funky kids’ toy, but I always appreciate architecture that has at least the guts to be different. Tirana has many colorful apartment buildings, oceans of paint covering up the drab colors of communist-era architecture. Albania is a poor country, but the center of Tirana is very nice and blooms with sidewalk cafes and restaurants abuzz with people drinking espresso. It is said that half the population of the town brews coffee and the other half drinks it. I only spent a short time in Albania and the country was a big surprise to me. The people are open and friendly and full of curiosity about the rest of the world. It’s amazing they have so much spirit left after having been suppressed under a cruel communist regime that lasted almost half a century. The cheeriest country of them all. There’s always something fun to see by the side of the road. Billboards like this one for cough medicine, and small shops and businesses with names like MY WIFE LOVES ALL ENT., GOD IS GREAT HAIR CUT, HOLY TRINITY FAST FOOD, DRESSED TO KILL BOUTIQUE, and so on. Who needs TV I ask you. And now, dear reader, it’s your turn. Please tell me about your bits and pieces – colorful vendors, interesting statues, fun buildings, anything entertaining. As always, I love your stories. I’m sending the one with the statue to my Romanian friend in Belize who cannot stand her mother-in-law. Are you home now after traveling to the U.K? I loved this bits and pieces – especially the cheery billboard in Ghana and that wonderful cherry cake building in Albania. Over here in Sweden they have signs declaring: Fart hinder… Cracks me up every time although I should know better! (It’s the Swedish for speed bumps). Oh you took us all over the world in one post Magnificent What a great experiences. I am happy that I won’t have to live with my mother in law.That wouldn’t be easy for both of us. I love the statue and the pink building. What lovely photos! I love the mispelled signs in Botswana- especially all of the ‘penal beaters’. I try not to speculate what exactly is done there. There was (maybe still is) a shop on the way out to Krokrobite in Ghana called “Jesus Saves Fashion”. Still cracks me up.